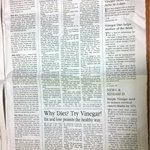 <- This totally legitimate ad for vinegar was in the morning paper. I think my favorite "article" is "Vinegar, Better than Prescription Drugs?" I will say: no...no it is not. <- Carrie and her friends Jenna and Malika came to visit us, and we played a rousing game of Star Trek Catan!